Something strange has happened to June 4th over the years since the day it was immortalised as an important historical date in 1979. Speaking on various radio stations in the run up to the controversial 33rd anniversary, Mr. Kofi Adams, the suspended Deputy General Secretary of the NDC who is also a Special Aide to former President Jerry John Rawlings, many times used the word “we” to denote what a group of people, including himself, had done in preparation for the Aflao celebration. For example, he said on Peace FM: “We have spoken with the Paramount Chief of the Traditional Area”, “We have already sought police permission…” Who exactly are the “We” in the Adams discourse? On the face of it, the “We” should be the National Democratic Congress, whose Constitution claims June 4th as the Party’s provenance. However, as we all know, the “official” NDC, which suspended Adams, virtually dissociated itself from the June 4th rally at Aflao. This means that the “We” probably refers to either the Nana Konadu Agyeman Rawlings wing of the party or the office of the former President, which employs Mr. Adam. The NDC will probably say that there is no Konadu faction but it will be hard to convince anyone that her faction does not exist. It is now equally difficult to say that the NDC party as a whole agrees that June 4th continues to be as important as it was vaunted to be in the past. It now appears that former President Rawlings and his household and office, rather than the party as a whole, have appropriated June 4th as a personal symbol and resonance of what the former President claims to stand for. No one can blame President Rawlings for feeling protective of the legacy of June 4th, or even for feeling that the day belongs to him. In truth, he may not have claimed it; it has been thrust on him by default or national acclaim, for the annual ritual of “boom speeches” if for no other reason. Back when the NDC was being formed, it must have seemed like a good idea to source its umbilicus to June 4th, although it is also possible that this idea could have been the singular brainchild of the Founder. It has served the former airman well by giving him a separate platform on which to extend his battery life beyond his constitutional mandate, assuming anyone expected Rawlings to shut up after his presidency ended. But until now, it was not obvious that this was more a personal and political platform for Rawlings instead of one that meant the same to the NDC as a party. On recent evidence, it can be said that June 4th was never a serious issue for most members of the NDC. The question is this: How did such an important historical event come to be owned so exclusively by one political party, or even one political family? The answer can be supplied by one simple fact: June 4th has been misread as a historical phenomenon for a long time and in the process, June 4th myths have supplanted facts, and the wonder is how academia and the media have allowed this to happen. This is not to argue that Rawlings was not central to the June 4th story. He was. Obviously, the motivation for the troops getting out of the barracks on June 4th was to free Rawlings from detention at the Special Branch (now BNI) for leading the aborted 15th May uprising. Obviously, therefore, Rawlings, despite being central to the drama that unfolded subsequently, could not have been the “architect” of June 4th. Unfortunately, over the years, the idea has taken hold in the public imagination that Rawlings planned and executed the June 4th Uprising. The issue though is not about who planned and executed the Uprising. Rather, the focus should be on the historicity of June 4 within the country’s larger chronological narrative. What produced June 4? Did Jerry Rawlings and Co simply wake up one morning and decided to “do” June 4? Rawlings and Co caused the June 4th Uprising at the tail end of a relentless display of discontent by all sections of society against the political and economic policies of the Supreme Military Council (SMC). In January 1972, Colonel Kutu Acheampong seized power from the Busia government and installed his National Redemption Council in power. This was composed of young officers who without espousing any specific ideology, made efficiency and the need to grow our own food the cornerstone of its policies. In 1975, the top brass of the military staged a quiet coup and put themselves in power as the SMC pushing out the mildly nationalist NRC into the background. Things went pretty downhill, especially with the economy in tailspin. The reasons for this are complex but not the subject of this article. Under pressure, General Acheampong (he had promoted himself and all his cronies) decided to replace the known constitutional arrangement with something known as Union Government packaged to be an inclusive government of the military, police and civilians. A referendum was held to test public opinion on the issue. The referendum was a farce. If anything, it showed that Acheampong did not know how to rig elections. Protests in the form of demonstrations, strikes and even sabotage ensued. Students, civil servants, workers, doctors, teachers, engineers, the business community, and all manner of people apart from the few who benefitted from the regime, joined the protests. 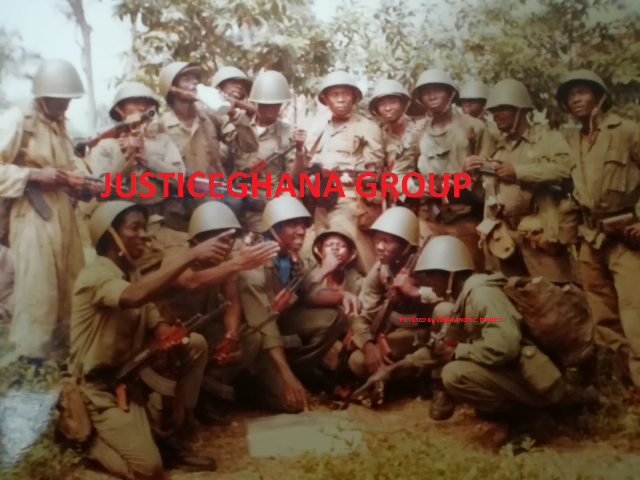 The military mainly supported Acheampong and his cronies as far as we could glean from their public behaviour, although many soldiers privately were sympathetic to the dissidents. In July 1978, Acheampong was replaced in a palace coup by General Akuffo and it is instructive to recall that Flt Lt. Jerry John Rawlings was the young officer who led General Akuffo to inspect the guard of honour at the airport on the latter’s only foreign trip as Head of State to Senegal. University campuses, not the barracks served as the cradle of the revolution that everyone expected. The People’s Movement for Freedom and Justice was formed in 1977 as a coalition of those who opposed the SMC. It was led by Professor Adu Boahen with Nana Akuffo Addo as the General Secretary but it was a broad-based group which had in its ranks people of all political shades and opinions. However, many groups operated underground on campuses, workplaces and in the military. Some were linked in a network although in the main, they were independent of one another. It was during this ferment that the late General Akwasi Afrifa predicted in a letter to Acheampong that one day soon all senior military officers would be rounded up and shot. Afrifa was not alone in prophesying apocalypse sooner than later. He was rounded up and shot. In a sense, almost the entire country expected something to happen although no one could have known the form it would take. Obviously, a military solution was always in the offing and students in particular goaded and needled young military officers into doing something. The need for that something receded somewhat from early 1979 because the regime under General Akuffo had already announced elections to return the country to constitutional rule. June 4th was therefore a response to the people’s call for dramatic change. In the course of the tumult and agitation that preceded it, people confronted the regime in diverse ways and some lives were lost. By the time June 4th occurred, the political battles had been fought and won not by soldiers but civilians. June 4th therefore is a very important date in Ghana’s history and significant because it was the culmination of a long period of protests by a large section of society, including many conservative elements who would normally baulk at the idea of revolution. Former President Rawlings and his friends are right to tie June 4th to the need for accountability because that was also the rallying cry of those who confronted the SMC for four years before 1979. The historical essence of June 4th should therefore be seen in a clearer perspective and not to be confused with what happened on that day and subsequently. The nation must deal with June 4th in that way because although it is now a divisive issue, back then in 1979, even a bewildered nation knew why it had happened. June 4th had no political programme and the limited nature of its self-declared mandate can be gleaned from the term “house cleaning” which was used to describe its purpose. People who supported it are today found in all political parties, but more importantly, June 4th was the product of a historical period and process to which several people and parties can lay claim. Ghana and Ghanaians as a whole should own June 4th, which is perhaps the message of boom speeches past and present. Therefore, the idea is that the entire nation could observe June 4 as National Accountability Day.